The third day of the Battle of Gettysburg was hot and humid. The battlefield, littered with thousands of dead and dying, bore grim testimony to the fierce fighting of the previous two days. The smell of decomposing corpses and gunpowder lingered in the air as the heaviest artillery bombardment of the Civil War ended. Then, in three lines of battle, 10,500 Confederates marched across the battlefield and surged up the gentle slope of Cemetery Ridge toward the waiting Federal troops. On the left of the Federal line on the ridge, Brig. Gen. George Jerrison Stannard and three weary regiments of his inexperienced 2nd Vermont Brigade anxiously awaited the Confederate assault. The Rebels struck farther up the line, directly to the right of the Vermonters. Stannard, seeing this, wheeled two of his regiments around the Confederates’ exposed flank. From their forward position, the nearly 1,500 men of the 13th and 16th Vermont regiments poured devastating point-blank fire into the enemy ranks. Inflicting terrible casualties and ravaging the Confederate flank, the Vermonters helped turn the tide of the battle and of the war itself. Stannard’s performance that day was the high point of his distinguished career. Stannard was born October 20, 1820, in the town of Georgia, Vermont. Educated in local schools, he worked on the family farm and taught school during winters. He later worked as a clerk and as manager of a local foundry before becoming joint proprietor in 1860. On September 26, 1850, Stannard married Emily Clark. They had four children. Besides raising his family and working at the foundry, Stannard was a member of the state militia. He joined when he was only 16 and served as an orderly sergeant in 1837 when the Vermont militia was called out during the Canadian Insurrection. In 1857, Stannard was elected first lieutenant of a company he helped organize. A tall, bearded, slightly balding man, Stannard was a commanding character. He possessed a strong ability to lead, and was appointed colonel of the newly formed 4th Vermont Militia in 1858. Stannard, the first Vermonter to volunteer for service in the Civil War, was appointed lieutenant colonel of the 2nd Vermont Infantry in May 1861. His regiment was sent to Washington, D.C., in June and was assigned to Colonel Oliver Otis Howard’s brigade. At the Battle of First Manassas, the brigade was held back until the closing stages of the contest, when it covered the retreat of the Federal Army. Soon after Manassas, Stannard was offered command of the 3rd Vermont Infantry. He humbly declined the position, opting instead to remain with his regiment. On October 10, 1861, the 2nd Vermont was brigaded with its sister regiments, the 3rd, 4th, 5th and 6th Vermont Infantry regiments, forming the famous Vermont Brigade. On May 21, 1862, Stannard was appointed colonel of the 9th Vermont Infantry and returned to Vermont to supervise recruitment of the unit. On July 15, the regiment began its trek south. The Vermonters arrived in Virginia a week later and were assigned to Fort Siegel, near Winchester. After the Federal defeat at the Battle of Second Manassas, the fort was threatened by a superior Confederate force and abandoned. Stannard took his men to Harpers Ferry, where they, along with 11,000 other Federal troops, were cut off when the Confederate army crossed the Potomac on September 5. Stannard repeatedly urged the post commander, Colonel Dixon Miles, to move the garrison to a more defensible position or else attempt a breakout, but his requests were to no avail. On September 15, after two days of shelling, Miles ingloriously surrendered to Maj. Gen. Thomas J. Jackson. Upon receiving word of Miles’ capitulation, Stannard attempted a breakout of his own with the 9th Vermont. He surrendered only when he was cut off as he tried to cross into Maryland. The 9th Vermont was among the last Federal troops to surrender. The captured garrison was paroled immediately by Jackson, who was in a rush to link up with the Confederate main body. However, Stannard wished to slow down the Rebels and refused to sign his parole or that of his regiment. He made his Vermonters individually sign their paroles, thus delaying the Confederates for hours. Stannard and his men were sent to parole camp in Chicago, and were not formally exchanged until January 10, 1863. They were then assigned to guard Confederate prisoners at Camp Douglas, Ill.
On March 11, 1863, Stannard was appointed to the rank of brigadier general and given command of the 2nd Vermont Brigade, which consisted of the 12th, 13th, 14th, 15th and 16th Vermont regiments–all nine-month volunteers. Mustered into service in the fall of 1862, the brigade had seen no action except for a minor skirmish in December. Stannard assumed command on April 20 and was warmly received by the men and officers of the brigade, all of whom were aware of his outstanding reputation. They had been very dissatisfied with their last commander, Brig. Gen. Edwin H. Stoughton, who had been captured in a daring midnight raid on his headquarters by John S. Mosby and his Confederate raiders. During the spring of 1863, Stannard’s Vermonters protected the supply lines below Washington as well as the Orange & Alexandria Railroad from Bull Run to the Rappahannock River, maintaining 20 miles of picket lines and 30 miles of railroads. On June 20, 1863, Stannard was ordered to take his brigade and join the northward-marching Army of the Potomac. Three days later, with less than a month remaining in their term of service, the Vermonters were assigned to the 3rd Division of I Corps. Stannard’s footsore men covered 120 miles in just six days, and gained a day’s march on the rest of the corps. When the Battle of Gettysburg began on July 1, Stannard was ordered to rush his brigade to reinforce the embattled I Corps, leaving behind the 12th and 15th Vermont to guard supply trains. The three remaining regiments of Stannard’s brigade arrived at Gettysburg in the evening, too late to see any action that day. The brigade was posted on Cemetery Ridge, with the 16th Vermont deployed as pickets and Stannard appointed as general field officer of the Federal left wing for the night. The next morning Stannard was placed in command of the infantry support for the Union artillery batteries on the left of Cemetery Ridge. During an ensuing artillery duel, a shell burst knocked him down, but he was uninjured. Stannard and his 2,200 men did little until late in the day, when III Corps was driven from the peach orchard by repeated Confederate assaults. The Vermonters were called upon to fill a major gap in the Union line and, with a determined charge, helped re-establish the line. The 13th Vermont then handily drove back a regiment of Confederates, saved the guns of the 5th U.S. Artillery and captured 80 Rebels. As night came, Stannard consolidated his brigade’s position on Cemetery Ridge and again placed the 16th Vermont on the picket line. The Vermonters, who had performed gallantly in their first major engagement, spent the night on the battlefield. At 4 a.m. on July 3, the picket line of the 16th Vermont was probed by Confederate infantry, and heavy skirmishing continued throughout the morning. Later, a brief exchange of artillery fire inflicted a few casualties among the Vermonters, and enemy snipers took an interest in Stannard. Bullets pierced his coat and took off a piece of his hat. At about 11 a.m., almost all firing stopped. The Confederate attack on the Federal right had failed, and for two hours an uneasy lull settled over the field. Then, at 1:07 p.m., two enemy guns fired, signaling the opening of the greatest artillery bombardment of the war. For the next hour and 45 minutes, the Vermonters clung to the ground behind their crude breastworks as Stannard paced up and down their lines. Shot and shell whizzed over their ranks, but most of the rounds harmlessly overshot the Vermonters. The artillery then stopped, and on a front almost a mile wide, 10,500 Confederate infantrymen advanced toward the center of the Union line on Cemetery Ridge. In three lines of battle, with parade-ground order, the ensuing attack known as Pickett’s Charge was an awesome sight. The skirmishers of the 16th Vermont fired a few shots, then hastily fell back and re-formed behind the 13th Vermont. As the Confederates advanced farther toward the Federal lines, their right wing appeared to be aimed at the 14th Vermont. But as the Vermonters rose to fire, the Confederates changed direction and moved across the regiment’s front to close a gap that had appeared in their line. The 14th Vermont opened fire at about 300 yards. The 13th Vermont soon added its rifles to the fire. The Confederates advanced to within 20 yards of II Corps on Cemetery Ridge. After exchanging a few volleys, they charged with a Rebel yell. Striking the Union center hard, they charged and drove a Pennsylvania regiment from the soon-to-be-famous ‘Angle. The Rebels were now concentrated to the right of the Vermonters’ position. Stannard saw the tremendous opportunity presented by the situation. Despite the risk of exposing his brigade’s left flank, he launched a flanking attack on the Confederates. Ordering the 13th Vermont to march right, closer to the point of the enemy attack, he directed the men to change front forward on first company. Swinging out at an oblique angle to the Union line, the regiment opened fire at half pistol range on the exposed flank of the Confederates. As the 13th Vermont moved into position, Stannard ordered the 16th Vermont to join the 13th. After the 16th Vermont was in line next to the 13th, the two regiments advanced toward the Confederates while continuing to pour deadly fire into the now-shattered butternut ranks. The enfilading cross-fire ravaged the densely packed Rebels, driving them back and crowding them toward their center. As the Vermonters began their flanking movement, Maj. Gen. Winfield Hancock rode up to Stannard. He, too, saw the opportunity for a flank assault, but Stannard’s men already were in motion when he arrived. Moments later, Hancock was shot in the groin and caught by two of Stannard’s staff as he fell from his horse. Stannard used his handkerchief and revolver to make a tourniquet for the stricken general. Meanwhile, the fighting in front of the Vermonters ended. They had devastated the Confederate right, inflicting heavy casualties and taking hundreds of prisoners as well as the colors of the 8th Virginia Infantry. Two additional Confederate brigades, sent to support Maj. Gen. George Pickett’s assault, now belatedly advanced directly toward the 14th Vermont. Again the Vermonters promptly opened fire as the Rebels came into range. Stannard, waving his sword and hat, promptly sent the 16th Vermont and four companies of the 14th charging into the Rebels, capturing many additional prisoners as well as the colors of the 2nd Florida Infantry. The Vermonters fell back to their original positions as Confederate artillery resumed fire, covering the retreat of the defeated infantry. During the final artillery barrage, a piece of shrapnel struck Stannard in the right thigh and passed down three inches into the muscle. Though the wound was extremely painful, Stannard refused to leave the field until his wounded men had been cared for and his brigade relieved. The 2nd Vermont Brigade performed as well as veteran troops at Gettysburg, but not without loss. Of its nearly 2,400 men engaged, 342 were killed, wounded or missing. Stannard’s superiors realized the significance of his actions. Major General George Meade said, There was no individual body of men who rendered a greater service at a critical moment then the comparatively raw troops commanded by General Stannard. Major General Abner Doubleday said: It is to General Stannard…that the country is mainly indebted for the repulse of the enemy’s charge and the final victory of July 3. [His] brilliant flank movement… greatly contributed to if it did not completely insure our final success. The 2nd Vermont Brigade mustered out of service after Gettysburg. Stannard convalesced for a short while, and in September he was placed in charge of the defenses of New York Harbor. In May 1864, he was given command of a brigade in XVIII Corps and was wounded at Cold Harbor. Two weeks later, he led the remnants of his brigade in the initial attack on Petersburg. On June 20, 1864, Stannard was given command of the 1st Division of XVII Corps. His 3,000 men participated in the early stages of the siege of Petersburg, where he was accidentally shot in the hand by one of his own officers. On September 29, Stannard led his division in a early morning assault on Fort Harrison, a formidable redan in Richmond’s outer defenses. Advancing over 1,400 yards of open terrain under murderous artillery fire, his men sustained heavy casualties but quickly captured the fort. Fighting for the surrounding positions continued until nightfall. General Robert E. Lee personally supervised the preparation of the 10 brigades that counterattacked the next day. As the first wave was repelled, a wounded and captured Alabama colonel saw Stannard standing on a parapet. The Rebel officer yelled to him, Well, you had better get out of this, General, for General Lee is over there, and he says he will retake these works if it takes half his army. Stannard replied that he would be happy to see Lee whenever he chose to call, and continued to pace the parapet waving his hat and sword. As the next wave was repelled, a Minié bullet struck Stannard’s right arm, shattering the bone and spinning him halfway around. As a result of his wound, Stannard’s right arm had to be amputated at the shoulder. A third wave of Confederates also was repulsed, and the fort remained in the possession of the beleaguered Federals. The two days of fighting cost the Confederates about 2,500 men, the Federals 2,272. Stannard returned to Vermont to recover, and received a hero’s welcome. For his bravery at Fort Harrison, he was breveted major general on October 28. In December, he was appointed commander of the northern frontier of Vermont, and remained as such until the end of the war. He later served in the Freedmen’s Bureau and resigned from the military on June 28, 1866. In 1868, Stannard was appointed collector of customs for Vermont. Later he served as a doorkeeper of the U.S. House of Representatives. He died of pneumonia in Washington on June 1, 1886, and was buried in Burlington, Vt., after a tremendous state funeral. Stannard remains one of Vermont’s most distinguished soldiers of any war. The town of Stannard and Stannard Mountain are named after him. A courageous and selfless soldier who inspired his men with his coolness and presence, his actions at Gettysburg and Fort Harrison were critical to those two Federal successes and remain among the most significant contributions to the Union war effort by the brave soldiers of Vermont. Nevertheless, the Georgians eventually were forced to yield after heavy losses. The Federals poured through the breach, but once again, a Gordon counterattack, aided by Doles’ remnant, restored the Confederate line. Losses in the 44th Georgia, which had borne the initial shock of the breakthrough, were horrendous–26 killed, 28 wounded and 182 captured. Company I lost 38 men out of 63. The regiment, now reduced to a few squads, participated in the rest of the Spotsylvania campaign, but never regained true fighting strength. It stayed with the brigade until the end, suffering a steady hemorrhage of casualties throughout Early’s Shenandoah Valley campaign in the autumn of 1864. It was present at Fort Steadman on March 25, 1865, and in the final assault at Appomattox Court House, where a flag of truce halted further hostilities on April 9, 1865. Two days later, when the remnants of the Army of Northern Virginia stacked arms, 62 survivors of the 44th Georgia were present for duty, out of the original 1,115 who had left home in 1862. As Captain John Harris remembered years later, The impartial historian, when he collects up the facts and figures, will show that the 44th Georgia Regiment suffered a greater casualty in killed and wounded, in proportion to the number carried into action, than any other regiment on the Southern side. After struggling over the fence along the road, the men of the 35th Massachusetts wheezed and crawled part way up the hill toward the crest. Climbing over a split-rail fence on the hilltop east of Otto’s Farm, the regiment continued to advance to the right, in full view of Sharpsburg. A shellburst from a Confederate battery in the field beyond plowed into the regiment, killing two. The regiment halted momentarily, then started to withdraw. At the same time, a Rebel battery on the heights along Boonsboro Pike also fired. Hudson, once again on an errand for Ferrero, sauntered across the bridge with an order for Hartranft when a shell exploded and sent fragments whizzing along the steep hill in front of him. Two more shells burst nearby. The barrage caught Bell about 50 yards from the bridge. He had just slapped Private Hugh Brown on the shoulder as he passed, exclaiming, We did it this time, my boy! Barely two steps away, a ball from the second case shot glanced off his left temple. The impact whirled Bell around in a circle and slammed him on his side. Men rushed to his aid as he rolled down the creek bank into the regiment’s stacked muskets. Concerned, they asked if he was badly hurt. Bell, the left side of his face quickly reddening with blood, put his hand to his temple and calmly replied, I don’t think it is dangerous. He paused. Boys, never say die, he added. Hudson found the left wing of the 51st Pennsylvania sprawled along the creek bottom. He asked, Where is your lieutenant colonel? There he is, sir, wounded. Hudson’s gaze fell on a stretcher being borne toward the bridge. The officer being carried stared fixedly in Hudson’s direction as he was carried south. His dimming glance hurt Hudson badly. An ugly blue bruise was on Bell’s left temple. Bell, a newly made friend, was dying. Hudson abruptly turned to meet Hartranft, who was coming down the road. Hudson asked why he had not advanced to support the 35th Massachusetts. I’ve no ammunition, Hartranft snapped. The two frustrated officers stood there in the road, at a loss for words. They both had to answer to the moody Ferrero. Eventually, Hudson ventured, Shall I tell the colonel so? If you please, said Hartranft. Hudson jogged toward the bridge. He saw three men from his old company struggling with a very heavy man on a blanket. A quick glance at the hat and the way the men tried to tenderly treat the officer told him that the fellow was Lieutenant James Baldwin. You must excuse me, Hudson called out. I’ve got something to do across the bridge. With that, he hurried to deliver his latest message to Ferrero. Lieutenant Colonel Joshua K. Sigfried of the 48th Pennsylvania, upon crossing the bridge, immediately detached Captain Wren and his B Company as skirmishers, with orders to cover the quarry and the ridge to the right. The plucky captain and a couple of his people detoured slightly to check on the Confederate that Wren had shot. They found a dead man lying beside the same tree. Captain, one of the men chimed in, that is your man. Wren’s men fanned out and began to scramble up the hill. As the ground widened, the captain sent back for more skirmishers. Brigadier General Sturgis personally sent more men to assist. The skirmishers scrounged the far hillside for souvenirs as they proceeded. They discovered the remains of the 2nd Georgia in a slight entrenchment near the top of the hill. Over 40 Rebels had fallen as a unit in near-perfect formation. Lieutenant Colonel Holmes lay five paces behind his color guard, riddled with bullets. Union soldiers set upon the colonel’s beautiful dress uniform; one stole Holme’s expensive gold watch, others cut the gilt buttons off his tunic. Captain Joseph A. Gilmour claimed a shoulder knot. Two men pulled the polished boots off his feet, then callously flipped a coin to see who would have the matched pair. Corporal Dye Davis of Company B happened upon a dead Confederate whose haversack bulged with johnny cakes. Dye coldly jerked the haversack free from the dead man and poured its contents into his own sack. He started to munch a chunk of the captured cornbread as the company moved out. A friend reprimanded him, commenting that he could not eat anything that came from a corpse. Damn ’em, man, Dye retorted through a mouthful of bread. The Johnny is dead, but the johnny cakes is no dead. He kept eating away. The Federal regiments down by the creek, on the other hand, acted like vanquished troops. The stubborn Georgians, besides holding the entire corps at bay, inflicting severe casualties and causing the frustrated Yankees to needlessly expend an inordinate amount of ammunition upon inferior numbers, had scored an emotional victory. General Burnside had won his bridge–ever after to bear his name–but the crossing had been so delayed as to render his victory meaningless. This article was written by Anthony Buono and originally appeared in America’s Civil War magazine. For more great articles be sure to subscribe to America’s Civil War magazine today! I am sure third cousin Joe will be interested in this one. These are raw notes I had kept a few years back. My name Is Dan Hrlic and I am looking fo Info on a Peter Dubia and Laura Banes or Barney. Peter was my great-great-grandfather on mom’s side from Williston, Vermont and Westmister also Tiltion New Hamshire area. May include siblings or parent who were soldiers, location of death vs. burial, etc. Are you a descendant, but not listed? Register today. I thought that if there are any Dubias that may be connected to my Abram they might like to know that he had a son Pierre (Peter) who served in our Civil War. 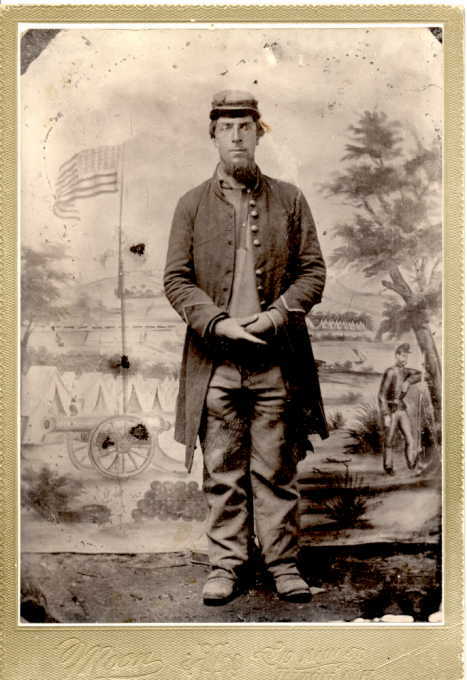 He enlisted on Sept 10 1862 with the 13th Vt co. E Inf. from Williston, Vt. He was at Gettysburg. He was born about 1835-37. My brother is a Civil War re-enactor who has a book all about the 13th and I have asked him to find out what other campaigns the 13th were at as we know he was wounded. He mustered out July 21 1863 at Brattleboro Vt.
You never know when raw notes might become handy on Our Ancestors. Peter Dubia was a household name on this blog along with his father Abraham and his mother Geneviève Ballard dit Latour. This is what is so interesting about genealogy… it never stops. There is always something to feed your frenzy. I have gathered so much information about this family I feel like an adopted descendant. Having found on Ancestry a photo of Peter Dubia that was shared in 2010 by Scott Lovely made my evening last night. Marie-Anne Lagace 1862 – ? Cyrrhosis of the liver according to Doctor Lortie. I don’t know if Herman Farmer was a heavy drinker. I hope not because my great-grand-aunt Marie-Anne must have gone through living hell. Talking about someone’s drinking problem is not easy even if this happened more than 100 years ago. I know my father and his father had a drinking problem so this is a touchy subject to write about. Romulus Robillard married Herman Farmer and Marie-Anne Lagace’s daughter Dora. I found them on Find A Grave and in the 1940 U.S. Census. Marie-Anne is Annie Lagace. She is 77 years-old and a widow. Marie-Anne was born on December 15, 1862, in Notre-Dame-des-Anges, Missiquoi County, Quebec. I have her baptisimal certificate. There is also a Lester listed also in the family. I don’t know who he is. This is the first time I come across a Lester Lagace who is said to be a brother-in-law. Was he instead Herman Lester Farmer, Dora’s brother? Looks like it. I wonder what happened to him? I wonder why Dora took her mother’s name instead of her father’s? And why Marie did the same after Herman died?